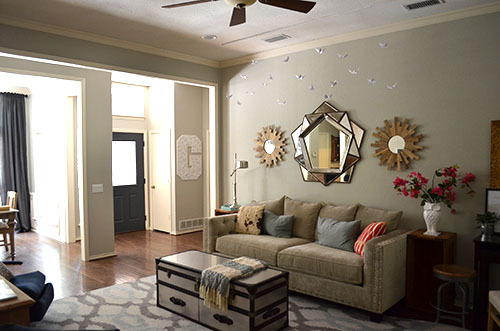 When decorating our formal living room, I wanted to figure out a way to emphasize the high ceilings. The first thing that came to mind was hanging some sort of sculpture from the ceiling. One thing led to another, and pretty soon I was spending my Friday night making origami pigeons. A friend of ours asked me, "How did you come up with that idea?" Honestly, I have no idea. I remember explaining my vision to the husband, and he looked at me like I had two heads! He could not picture it at all. I even made this little sketch for him, but he was still very skeptical. 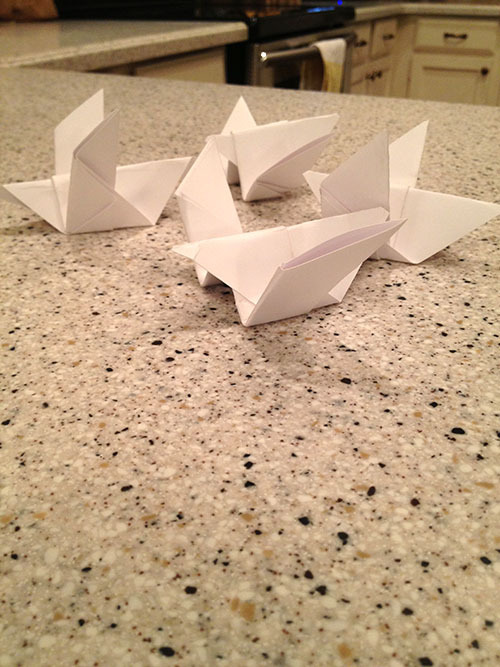 The first step was to make some origami birds. I didn't know how to do it, so I turned to my trusty friend Google and found this website. I liked the origami pigeon pattern the best, so that's the one I went with. 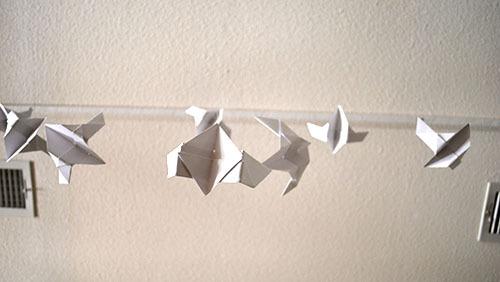 Using some white cardstock I had left over from another project, I made 20 paper pigeons. It's not too complicated, and it's a pretty relaxing thing to do while you watch TV. I used an Exacto knife to cut a tiny slit in the top of each bird so we could tie it to the fishing line. Then I went out into the garage to find something we could use to hang the birds. 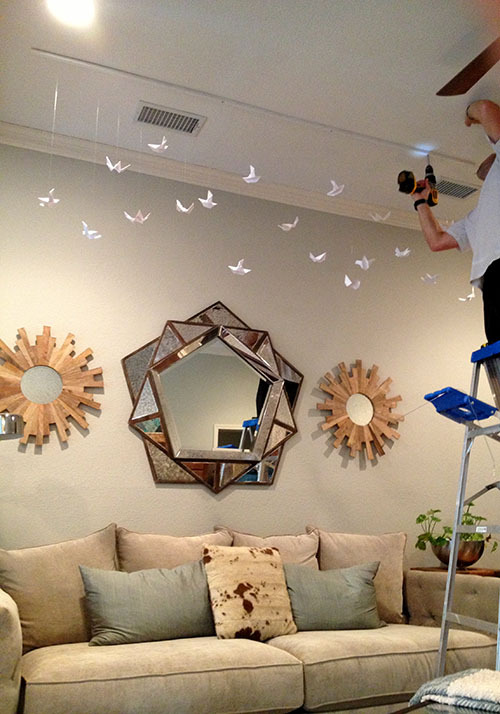 It was my plan all along to use fishing line to hang the birds, but I had no idea what I would tie them to. I ended up finding this piece of trim in the garage that was exactly the length of our sofa, so we didn't even have to cut it to size. I love it when things work out that nicely! I painted it white so that it would blend in well with our ceiling. 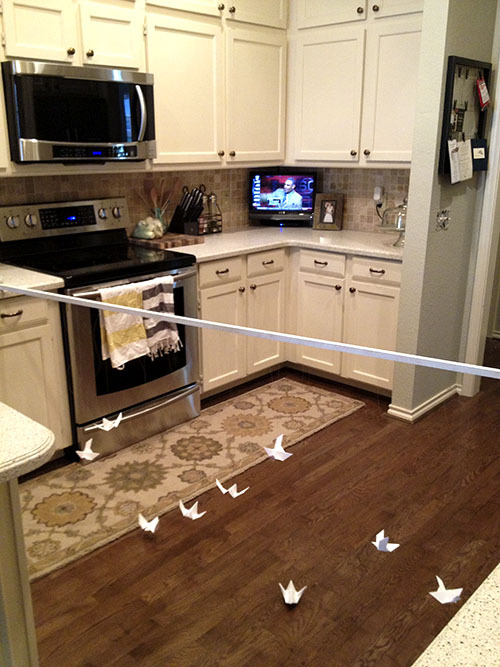 I quickly figured out that I could stretch the piece of wood from counter to counter in the kitchen, giving me the perfect set up to tie the pigeons to the trim piece. 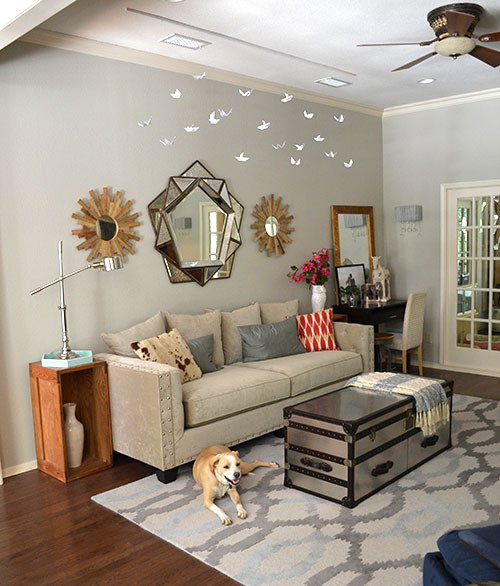 In another convenient twist, the distance from floor to counter was exactly the distance between the top mirror and the ceiling, so I knew that if I hung the pigeons at any length between the wood piece and the kitchen floor, it would also be the right distance when hung from the ceiling. YES. 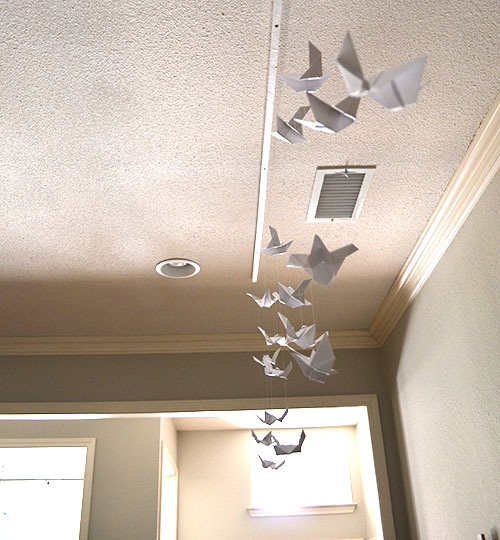 I just eyeballed the location of each paper bird because I wanted them to look random, but also balanced. The string attached to each bird was simply tied around the wood piece, so that step was a piece of cake. Once the mobile was created, it was time to hang it up. I had to get the husband involved for this part. He found the studs in the ceiling and used his electric drill to screw the wood piece into the ceiling studs. Now the birds were really flying! Of course, the best part is always stepping back to admire the finished product. Because I had all of these items on hand, I was able to create this modern art piece for free. I love free, don't you? I also get really excited about the fact that our living room has a unique piece of art that no one else can buy! So what do you think about our pigeons? They bring a smile to my face every time I walk by, and they catch everyone's eye right when they walk in the house. You may think I'm a nut for putting this in my living room; if so, this project would be really easy to reinterpret in a nursery or child's room if you're against hanging it in a main living space. 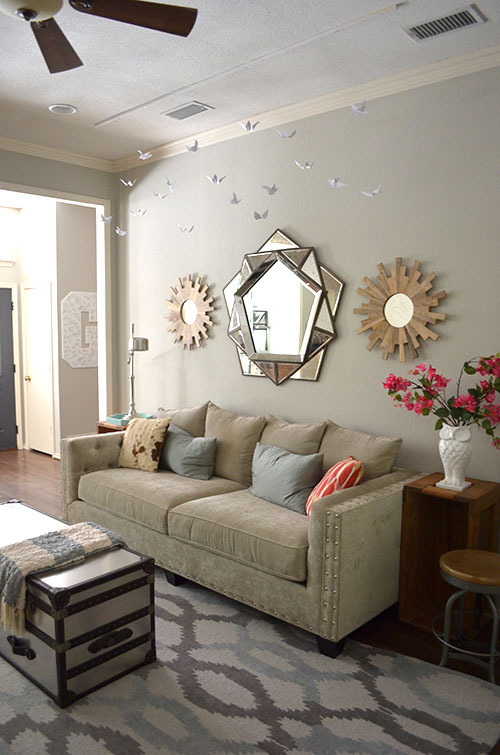 And if you're interested in another free wall art project made out of paper, check out my wall flowers here and here. 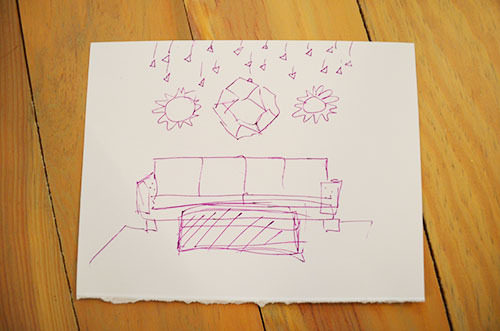 I have some wall flowers up in my office right now– white cardstock is my best friend!